Kobold’s portable DUC-MP and the stationary DUC-MF are designed for continuous non-intrusive flow measurement where accurate and drift-free operation is required for liquids in filled pipes. The devices are hygienic, leak proof and monitor all aggressive and toxic liquids without a problem. A special advantage is that the ultrasonic sensors are clamped onto the outside of the pipe, so cutting the pipe is not necessary for installation. Similarly, there is no requirement for process shutdown, significantly reducing the operating costs. The robust Quickfix mounting kit enables precise and quick sensor installation. With the Quick Setup option, the transmitter can be configured in less than one minute, and in less than two minutes, the sensors are mounted onto the pipe. By default, the transmitter operates at medium temperatures from -40 to 150°C and flow rates of up to 30 m/second in pipe sizes from DN10 to DN6000. DUC works on the high-precision ultrasonic transit time method. The AND-Technology (anti-noise deflector), results in the ultrasonic waves being guided and coupled in such a way that unwanted echoes and signal variations are avoided. The flow rate is measured periodically, typically 50-150 times per second. Because of the latest digital signal processing, DUC operates reliably even under influence of EMC radiations or unwanted machine noises. Accurate measurements are possible even where conventional devices fail, for example in unfavourable conditions, such as high particle and gas pollution situations. The clear menu-structure, easy operation via eight buttons and the large graphics-capable text display facilitate measurement. 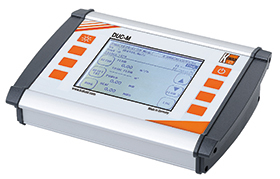 Battery operation and the 4 GB memory card make the portable version of DUC ideal for temporary measuring tasks. Application areas include power plants, water and wastewater, oil and gas, and food and beverage production.